So what’s good about this game anyway? The newly animated sprites, of course! Finally, I can experience a Pidgey flap its wings! 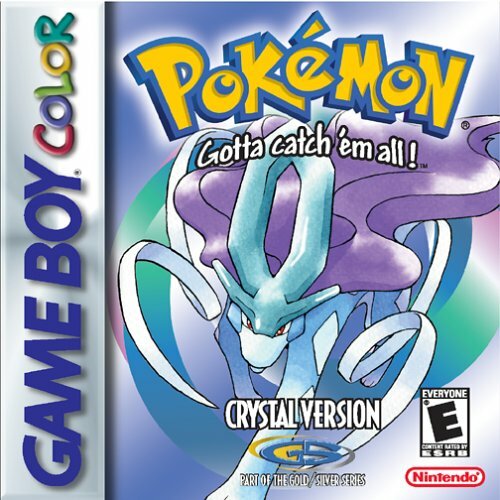 Kidding aside, Pokemon Crystal a really solid game with new mechanics on top of the familiar gameplay of the previous generation. One new feature I love is the day/night feature that changes depending on what time of day it is in the real world. So if you’re playing at 8pm after dinner, the game time would also be night. If you’re playing at 9am at school, the game time would also be at 9am while your teacher is wondering why you’re playing a Gameboy in the middle of class, you lazy geek. The time actually affects the events in game. The day and night cycle means that days go by, which feels like you’re actually progressing through time compared to Pokemon Red’s solitary sunny weather. Bug Catching Contests happen every Tuesday, Thursday, and Saturday so at least you have something to keep coming back to. Depending on the time of day, the Pokemon you can encounter on tall grass would differ so that means you’ll encounter the owl pokemon at night instead of the typical pidgeon. A new addition is the PokeGear feature which is like having an Android phone in 2001. You can access the radio and the town map so it’s Google Maps and Google Play Music before those were popular. I personally love the cellphone feature because it shows you that these trainers you encounter aren’t just people looking for a dogfight. They’re all human and they give you a little glimpse of their lives. The Youngster calls you to talk about his Rattata while the Lass calls you for a rematch. One fisherman named Ralph (I know, I love him too!) told me to call my mom and I was so touched and amused that I actually did. Pokemon Crystal even has you go to the Kanto region. You know? That region from Pokemon Red, albeit a reduced version of Kanto because Gameboy cartridges back then lacked space. So not only do you face new gym leaders in Johto, you can even face the previous generation’s gym leaders in Kanto and see if they hold up or if they’re just washed up drunks. As a player, it’s revisiting your first Pokemon game, which is really awesome because as a player, I felt like I was showing my Pokemon a tour of where I started my Pokemon journey. All of these considered, the big question is: Does it hold up the test of time? Is it still a good game compared to the newer Pokemon games? The answer is yes with with a huge asterisk on the side. The game is great as long as you make considerations, as with any retro game. Perhaps I’m just looking at these through rose-colored glasses - glasses that would probably make the game look better. Visually, it looks okay. The game sometimes looks like it was painted with MS Paint. Your character is forever a walking tangerine that stands out regardless of the time of day so you look you suffer from Minute Maid radiation poisoning. The 3-second animation of Pokemon during the start of a battle is a breath of fresh air but some Pokemon still look like they’re colored weirdly like Ampharos, Jigglypuff, and Mareep, among others. This could be excused because they were dealing with a limited amount of space and were just starting to utilize colors on the Gameboy Color. And just because Kanto is in the same cartridge as Johto doesn’t mean that it’s a full experience from the last game. In Pokemon Crystal, the Safari Zone in Fuschia City was closed until the remake so that meant I couldn’t catch any good Pokemon for 500 bucks. Seafoam Islands was reduced to a small bunch of rocks with Blaine in one of the caves (Poor guy). Cinnabar Island was destroyed by a volcano, leaving a Pokemon Center behind and the corpses of scientists have sunken below the sea. Victory Road and Viridian Forest were drastically reduced to mere paths and hallways. Worst of all, Cerulean Cave and Mewtwo are gone. I blame pollution. Damn Silph Co and their damage to the environment. Suffice to say, Kanto had an invasion of ravage landscapers so don’t expect the perfect Pokemon Red experience. In terms of gameplay, it’s Pokemon at its basic form. Now there are new types introduced to balance battles out. Steel beats rock as dark beats psychic. There could be more but I’m more of a brute force kind of guy who’s stubborn enough to think that a strong flamethrower attack could beat rock-type Pokemon. If you have either Pokemon Silver or Gold, there wouldn’t be much of a reason to buy this game then. Unless you just want animated sprites during the start of battles. Pokemon Heart Gold and Soul Silver already dealt with a lot of issues with Crystal so you might want to consider those games if you want the full intended experience. However, for a retro experience, to relive your childhood once again, get Pokemon Crystal. If I could find a copy and a working Gameboy Color, I definitely would. Otherwise, I can just play it on my phone.